A single victory from the final three fixtures would secure Portadown the one-off pre-play-off away to Carrick Rangers for the chance at promotion by beating the second-bottom Danske Bank Premiership club over two legs. It is a position the Ports have held for a number of weeks but defeats to Dundela and, most recently, Larne, have left the situation in the balance entering the closing stages. 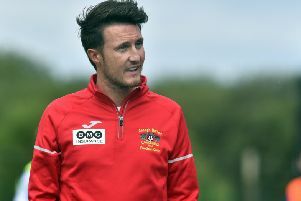 Portadown welcome Harland and Wolff Welders to Shamrock Park tomorrow (Saturday) before taking on Irish Cup finalists Ballinamallard United next weekend ahead of the regular run-in’s final game, a trip to Carrick Rangers. With a Rangers squad under the guidance of former Ports boss Naill Currie secure as Championship runners-up behind Larne, the Ports must now finish above both Ballinamallard and the Welders given Dundela’s decision to withdraw from the promotion process. Failure to secure a promotion position after 29 games stands as cause for concern within the Ports fanbase given expectations of a top-two position as a minimum entering the season. However, Tipton has issued an appeal for supporters to set aside frustrations and give full backing to the players on the pitch. “No-one feels the frustration greater than the management team or players, we are working every day to try and reach our goals,” said Tipton. “We obviously understand it is human nature to allow those feelings of disappointment or frustration to come out during games. “However, for the next two games we play at home and want to make full use of any Shamrock Park advantage. “The priority now is to get those points needed for the pre-play-off game with Carrick, that now stands as our immediate focus. “The aim is to get over the line as quickly as possible, hopefully on Saturday, even if it takes up to 90 minutes on the clock. “But if supporters can focus only on getting behind the boys and not allow any frustrations to transfer over to the players on the pitch then that can go a long way towards helping us. Kick-off at Shamrock Park will be 3 o’clock. q Saturday’s Championship game will feature two teams from Wicklow-based Sporting Greystones as guests - with friendly fixtures against Portadown Youth under 12s and under 13s scheduled from, respectively, 5.30pm and 6.45pm at Shamrock Park.